Stephen’s Auto Body & Towing has been doing business in the City of Melrose since 1984. We have been located at 140 Tremont St. since 1994, and have been growing ever since. We are located just outside Melrose center opposite the Melrose High School athletic facility. Stephen’s Auto Body & Towing has been an active member of the Melrose community contributing in many ways, from helping to tow floats in a local parade to hauling equipment for community associations. Whenever the opportunity has presented itself Stephen’s Auto Body & Towing has been available. The size of our facility also allowed us the chance to bring back to life one of the city’s aging fire apparatus vehicles, with a little hard work & some fresh paint this vehicle was able to serve the community once again. Owner Stephen Longmuir is a life-long resident of the city of Melrose. With deep roots and strong community ties, Stephen has chosen Melrose as both the place to call home for his family and the home for his business. With a background in the automobile industry for over 30 yrs Steve knows how important SERVICE and QUALITY are. 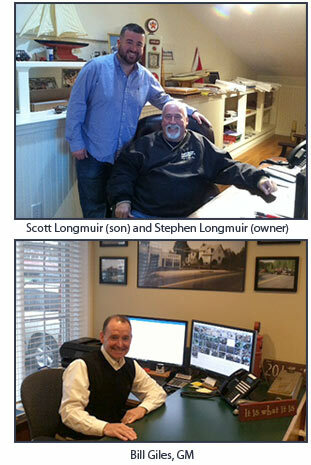 Scott Longmuir is a 2nd generation owner of Stephen’s. He is a life-long resident of Melrose and has worked with his dad and the company for over 14 years. He began here as a tow truck driver and has evolved over the years into his current position as a facility manager. Scott oversees daily production and makes sure Stephen’s Auto Body continues its strong ties within the Melrose community. Bill Giles brings over 35 years of experience in the collision repair industry as General Manager of Stephen’s Auto Body. Having grown up in Melrose and graduating from Melrose High he has a true appreciation of Stephen’s long standing connection to the Melrose community. Bill oversees the entire operation of the facility and is driven by providing outstanding customer service and great employment opportunities. Office manager Audrey Plavetsky has been with the company over 30 plus years, bringing to the business a professionalism only experience can provide. She provides office, accounting and H.R. support for over 30 employees here at Stephen’s Auto Body and Towing. If you are in need of auto body work then please give us a ring at 781-665-3400 or click here to use our Contact form. We will get in touch with you shortly and help you with your car body repair needs. We offer towing, rentals and much more to make sure your experience is great.